This massive landmass is separated from Seattle by Puget Sound and is home to legends, myths, and stories – some ancient, some more modern. Many people want to go hiking, camping, or take a road trip around the Olympic Peninsula, and I’ve done so a few times myself. If you’re planning a trip to Washington and have the Olympic Peninsula on your list, here are some of the spots I recommend. My suggested stops work best if you string them together in a three-day long road trip, but you can also visit some in a long day trip from Seattle. There are two ways to get to the Olympic Peninsula for a road trip. The first is by ferry from Seattle to Bremerton. If you choose this, I recommend going around the Olympic Peninsula in a counter-clockwise direction and head north out of Bremerton to start your road trip. The other way to start your Olympic Peninsula road trip is by driving down to Olympia, to access Highway 101. This blog post proposes road trip stops in a counter-clockwise route. From Olympia, you would turn north from Olympia toward Bremerton and work your way up the Western shores of Puget Sound. Hiking on Hurricane Ridge is a must-do in the summer. This trail is relatively easy to access and gives you a great view of the Olympic Range as you’re right in it. See some of the world’s tallest trees on the Olympic Peninsula. Did you know that many of the tallest trees in the world – outside of California – are in Washington? You can see the world’s tallest cedar or a towering fir… and forest bathing is really good for you! Explore the Hoh Rainforest. This is one of my suggested stops, but however long you can afford to stay in the rainforest, do! This ancient-seeming forest feels like the lungs of the world and there are some great hiking trails to explore. Soak in the hot springs. The Olympic Peninsula is home to some great hot springs, including the Sol Duc hot springs and the Olympic hot springs. Perfect to take out any tension from a day of driving. Trust me, you’ll find there are more great things to do on the Olympic Peninsula than you’ll ever have time for on a 3-day road trip. The Olympic Peninsula has fairly temperate weather, like most of the Pacific Northwest. Summers are warmer and drier; winters bring snow to the mountains. The Pacific side of the peninsula gets a lot of rain year-round – it’s just warmer in between the showers during the spring and summer than during the autumn or winter. I recommend driving around the Olympic Peninsula between May and August. During these months, you’ll get to enjoy the beautiful summer weather most Pacific Northwesterners like to keep secret, plus any mountain trails or roads will be clear and open (rather than potentially closed during the winter). If you’re visiting the Pacific Northwest and plan to do an Olympic Peninsula road trip, a lot of the items on my Seattle packing list will be helpful. In particular, waterproof hiking shoes or boots and a rain shell will keep you dry when you go out exploring on road trip pit stops. Driving sunglasses – A pair of good gradient glasses will protect your eyes from the sun and still let you see the road. I love these Ray Bans I recently got. Radio car adapter – Having one of these will mean you never lose the radio on the far side of the Olympic Peninsula where radio towers are few and far between. You can find loads of options on Amazon; here’s the one I recommend. This also has a USB charger – SCORE! A guidebook – I recommend Lonely Planet guides (disclaimer: I write for them), because I know they’re written by experts and locals. The Washington, Oregon & the Pacific Northwest guide will surely give you even more inspo for your trip. Other than road trip snacks and some water, you’re all set to hit the road! Now that you’re totally set and psyched to do an Olympic Peninsula road trip, the question is: where? Below you’ll find 11 spots and stops I recommend. Most of these are towns and some are natural wonders you should experience during your time in the area. You can visit as many or as few as you choose – I’ve also added two suggested itineraries at the bottom of this post to help you sort it all out. Whether you start your road trip by driving off the ferry or it’s your first stop north from Olympia, Bremerton is the largest town you’ll pass through. Bremerton is small compared to Seattle, with just 40,000 residents. That said, there are some fun local restaurants you can stop and enjoy if you’re hungry. The Bremerton Marina is also beautiful to walk along, and the city has invested in developing the waterfront into a nice area for visitors. Port Townsend is a classic Washington town: located at the northeast corner of the Olympic Peninsula, its primary industries are focused on timber and seafood. The smell isn’t great when the paper mill is operating, but there are some beautiful historic buildings including a Carnegie Library and the Jefferson County Courthouse and a cute downtown you can explore. If you’re passing through Sequim in the months of June and July, you should try and book some time to explore one of the many lavender farms in the area. In mid-July, Sequim is home to the Lavender festival, where you can purchase anything and everything made with local lavender. This has been on my bucket list as long as I’ve known about it! If you’re hungry, especially for dinner, Alder Wood Bistro is surprisingly delightful, and Mr. V and I had a wonderful multi-course dinner there in early 2016. Just outside Sequim, you can stretch your legs along the 5.5-mile Dungeness Spit. As the longest natural sand spit in the U.S., it’s a fascinating geologic formation, though you mostly look out across the Strait of Juan de Fuca toward Canada and the San Juan Islands. If you plan ahead, you can do one of the daily tours at the New Dungeness Lighthouse. Keep your eyes open along the way for birds and other wildlife, since this area is a wildlife preserve too. 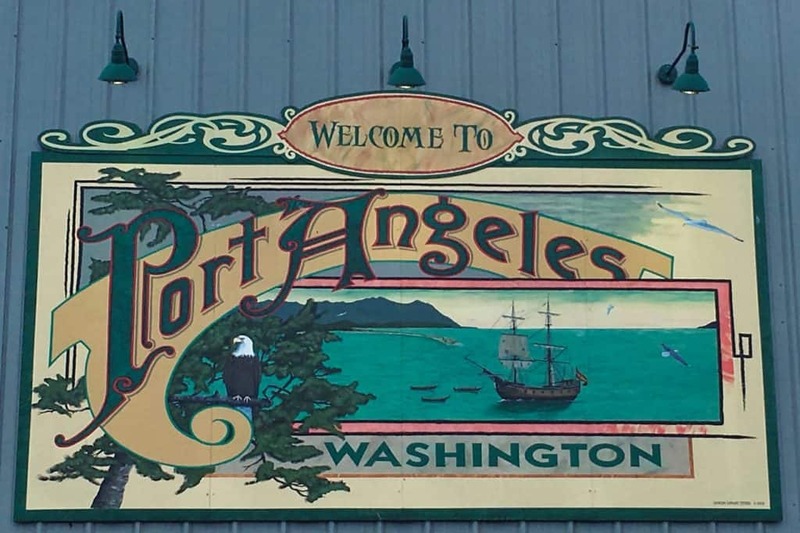 Port Angeles is the other major town you’ll pass through in the Olympic Peninsula, home to almost 20,000 people. As its name suggests, Port Angeles is a port town, and also has ferry access to Victoria, British Colombia. You can explore the historic downtown area and eat at one of the restaurants near the waterfront. There’s also a cool marine life center down along the waterfront where you can learn about some of the species that live in the water around Port Angeles. It was at Feiro Marine Life Center that I fell in love with barnacles! If your road trip timeline allows it, I highly recommend adding Hurricane Ridge to your itinerary. This slight diversion into the Olympic Mountains is great if you love hiking, and is one of the easiest ways to access the Olympic National Park. The Hurricane Ridge Visitor Center is 17-miles south of Port Angeles along Hurricane Ridge Road. The National Park Service keeps their website updated with road conditions throughout the year, so be sure to check this before planning your hiking excursion. The Elwha Dam is another excursion you can take from Port Angeles, depending on your interest. This dam isn’t actually a dam anymore; in 2011-2012, the dam was removed. Now, visitors come to the Elwha River valley to see how long it takes an ecosystem to recover after dams are removed (it’s being studied, too!). The National Park Service has been working on access to Elwha Valley via Olympic Hot Springs road, so be sure to check the website before driving up into the mountains. I would be completely remiss if I didn’t mention Forks on any road trip itinerary. I didn’t include it on the map above because it isn’t for everyone. You’ve got to be a “Twi-hard,” I think they’re called? If you are still a massive Twilight fan, Forks is a must-see. You can stop at a variety of intrepid businesses still capitalizing on the moment of glory Forks has enjoyed thanks to the books/movies… Don’t be surprised that it looks nothing like what’s in the movies! Hoh Rainforest is definitely one of the great wonders of the Olympic Peninsula. Of any stops I’ve mentioned so far, I’d say it’s the #1 “Must Stop” on the list. When you step out of your car in Hoh Rainforest, it’s easy to see why First Nations people in Washington thought these woods were home to spirits. They’re dark, eerie at times, and so full of green living things that it almost feels claustrophobic. Hoh Rainforest exists because the Olympic Mountains to the east ‘catch’ the damp air that comes off the Pacific Ocean along this part of the Olympic Peninsula. It rains an average of 155 inches per year in Hoh Rainforest – that’s almost 14 feet of rain! It’s easy to understand why there is moss on every inch of the trees, and those trees are towering giants! Spend a few hours walking in Hoh Rainforest if you have time. It’s one of the great wonders of Washington State, to be sure. Note: Hoh Rainforest is an 18-mile drive inland from Highway 101, so plan your time accordingly. Along the Pacific Coast of the Olympic Peninsula, there is stunning coastline and beautiful beaches. My favorite – and one of the most popular – to stop at is Ruby Beach. Ruby Beach is a stretch of classically rocky Washington beach where the Pacific ocean pounds into the Olympic Peninsula. Here, you can walk among the sea form, spot marine creatures on the rocks, and admire sea stacks standing out in the tumultuous water. It’s a perfect spot for an afternoon of exploring if you love marine life and the sound of the waves. The town of Aberdeen, population 16,400, is a good spot to ‘end’ your Olympic Peninsula road trip, as it is a straight drive inland from Aberdeen to Olympia where you can join up with Interstate-5 and head north to Seattle. Aberdeen is most famously known for its Nirvana roots. Kurt Cobain hailed from Aberdeen, and there’s ua memorial park in his name that you can visit. The sign as you enter Aberdeen reads “Come As You Are,” embracing Cobain’s impact on the Pacific Northwest music scene and what draws so many travelers to the area. To help you plan your own Olympic Peninsula road trip, here’s are two suggested three-day itineraries. In general, Option A gives you more time to explore the towns and communities on the Olympic Peninsula; Option B gives you more time to explore the natural scenery and great outdoors. You can choose the one that sounds better to you! No matter which option you choose, you’ll start by leaving Seattle aboard a Washington State Ferry bound for Bremerton. This ride takes about an hour, and once you disembark you’ll turn your wheels north on Highway 101. Consider grabbing lunch in Bremerton before you set out. If you choose Option A, you’ll just head to Port Townsend and can spend the afternoon exploring the area. If you choose Option B, you could make the detour to Port Townsend (adding an extra 30 minutes of driving time), plus swing through Sequim and stop to stretch your legs by walking along Dungeness Spit. Depending on the time you arrive, you could also explore Port Angeles or take a hike up Hurricane Ridge before the sun sets. If you choose Option A, it’s a short day of driving with lots to stop and see. Be sure to stop in Sequim and visit Dungeness Spit. You can also make time for a hike on Hurricane Ridge and a visit to Elwha Dam before settling into Port Angeles for the evening. If you choose Option B, it’s also a short day of driving – and the chance for a special add-on visit to either Neah Bay or La Push. I’ve never visited either (I’ve never had enough time on my road trips), but these small waterfront communities show what life is like in this remote part of the peninsula (and country!). No matter how you plan it, Day 3 is the longest day on the road – but there aren’t a ton of options for where to stay along the Pacific Coast of the Olympic Peninsula unless you plan to camp. If you choose Option A, set out from Port Angeles early – there’s so much to see, you won’t have time to do it all. You’ll want to drive to/through Forks, and only stop for 1-2 hours at the Hoh Rainforest and Ruby Beach respectively. You’ll have plenty of time on the road enjoying the forest-lined two-lane road as you head south to Aberdeen. If you choose Option B, you’ll have a little more time in the day. Once you set out from Forks, you can either spend longer at the Hoh Rainforest, or give yourself extra time to make any stops that inspire you on the way to Aberdeen. There are plenty of beautiful Pacific beaches to enjoy, and you may even want to time it to try and enjoy sunset at one of them. After you arrive in Aberdeen, it’s a 109-mile (175 km) or 2-hour drive back to Seattle. Like I said, it’s a long day! There you have it – everything you need to plan a great road trip around the Olympic Peninsula. Have questions? Let me know in the comments! Wow, how pretty are these spots?! Totally want to travel here now. I hope you can make it some day! Thanks for reading! Thank you for the article! I wanted to rent a car in Hillsboro and spend my vacation there. But your article inspired me to go on a trip and visit many more places. Thanks, Bob! I hope you have a great trip! Sounds like a great trip! Thanks for your comment, Darlene. I’d like to offer a third (and potentially quicker) way to get to the Olympic peninsula, which would be driving North out of Seattle to Edmonds, and taking the 30-minute ferry to Kingston.